Are you feeling bored? Restless? Trapped? We all get stuck in a rut sometimes. No matter how successful you are right now, I guarantee you there's something keeping you stuck where you are. Maybe you have an enviable lifestyle on paper. Maybe you already have the income, the title, the material possessions, and even the family you've always wanted. What once fired you up just isn't as interesting. Your drive is diluted and your mojo eludes you. You can't figure out why. All this is happening at the same time as the responsibilities continue to mount and the chaos of your life accelerates. You're letting life happen to you. That's why it's feeling predictable and uninspiring. No wonder you are restless, bored, and feeling trapped. This book will show you how to break through that self-imposed ceiling. So get ready to stop drifting and start living NOW. Scroll up and click "buy now" if you're ready to Design Your Future. Dominick Quartuccio's passion is helping people design a future they can't wait to live into. He is a mentor, speaker, trainer and author dedicated to supporting others to be better versions of themselves. 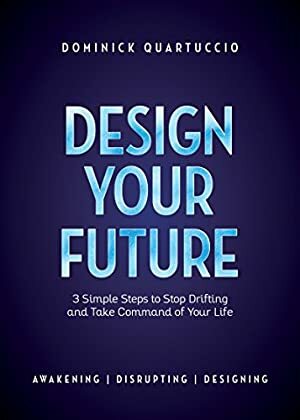 He helps successful, stressed and incredibly busy professionals take command of their habits, time, energy, focus, and execution so they can raise their performance in business and all aspects of their day-to-day lives. You'll love this book if your a fan of The 7 Habits of Highly Effective People by Stephen Covey, The Subtle Art of Not Giving a F*ck by Mark Manson, You Are a Badass by Jen Sincero, or Daring Greatly by Brene Brown. Log In to track Dominick Quartuccio on eReaderIQ. to be notified each time the price drops on any book by Dominick Quartuccio. to stop tracking Dominick Quartuccio. We started tracking this book on December 6, 2017. The price of this book has changed 6 times in the past 499 days. The lowest price to date was $0.99 last reached on April 10, 2019.